A new Hellboy has arrived, and with him comes a new assembly of monsters and villains from the comic books, but perhaps none is more anticipated than the fearsome Gruagach, played by genre veteran Douglas Tait, a man of many faces who is just as much a fan of horror as we are. Having already stepped behind the infamous mask of Jason Voorhees for a pivotal scene in 2003’s Freddy vs. Jason, Tait has made a career of portraying memorable characters in numerous iconic franchises, from J.J. Abrams’ Star Trek reboot to Marvel’s Thor, and now some of the biggest projects in Hollywood are calling him with offers. It’s been a long a road for the actor, who got his start playing Frankenstein at Universal Studios as a teenager, and he hasn’t forgotten where he came from, or lost the sense of magic that first drove him to perform. In our candid conversation last week, he discussed becoming Gruagach for Hellboy, playing Jason Voorhees, stepping into The Conjuring universe, and how it all started with a kid’s love for Halloween, among other stops throughout his already impressive career. Read on for our interview with Douglas Tait. Were you big into Halloween, the holiday, when you were a kid? Oh my God, I was the biggest Halloween fan since as far back as I can remember. I mean, I have video from when the first VHS camera came out, I still have this video of me making haunted houses, dressing up. It was something I thought about all year round pretty much. It was a big event for me, as much as Christmas, if not more. And I get this feeling when Halloween starts coming, even to this day at my age, certain smells and things bring me back. It’s just so – you know what I’m talking about – the smell of the masks. I love it so much. Literally talking about it right now is giving me the chills, because that’s how huge it is to me. It really is. That’s how I found you, Halloween Daily News, because I’m such a fan, and I was like, ‘Oh wow, they’re posting stuff every day about Halloween. Yeah, I’m a fan. It’s so cool. That’s awesome to hear. And thank you. That’s what we’re here for. So when did it first occur to you that you may want to be an actor? I grew up in L.A. I lived about 15 minutes from Universal. And as soon as I turned 16, I got a job at Universal, and I started playing Frankenstein. I played the Wolfman and Phantom of the Opera, and I went on to play Harry from Harry and the Hendersons. I did so much stuff there, but that was the start to all of it. That’s how it all started, and that’s how it’s all become what it has today, not by design or anything. It just kind of happened that way. You can definitely see the through-line, from celebrating Halloween as a kid to working at Universal and then right up to playing Jason. So how did you get involved with Freddy vs. Jason? I was getting small little roles. I started out doing basketball commercials and stuff. And I did little parts with like one line. But once I did Jason, it led to bigger stuff. How all that came about was I went to the first audition (to play Jason), and Ronny Yu, the director, he didn’t want to use Kane (Hodder). You know the story, and Kane was very upset about it, which I would be too. So when we went in, we had to do some movement stuff and we had to show emotion in the audition. I got a callback. Then they were considering me for the role. Fast forward to years later, from doing conventions with Ken Kirzinger, who ended up doing the movie as Jason, I learned that he went in for the stunt coordinator role and Ronny Yu was like, ‘Wow, you have a great size for this. What do you think about playing Jason?’ And of course he said, ‘Absolutely.’ So he ended up getting it. But then eight months later (after filming) they were getting bad feedback on the (original) ending. Basically what happened is in the original ending Jason Ritter grows claws next to Monica Keena in bed, and people thought that he was turning into Freddy, but that’s not what they were going for. So they decided to reshoot the ending. They had shot the movie in Canada. Ken’s Canadian and I’m from L.A., so they did the reshoots in L.A. and hired me to do the ending, coming out of the water. That’s how it all happened. It was honestly surreal for me, because I was a huge Nightmare on Elm Street fan, and working with Robert Englund was a pretty spectacular experience. Was it just one day for the reshoots? It was two days; a water day and a green screen day. Did you guys talk much on set? I definitely got to talk to Robert. He was telling about how they had been trying to do this for like 10 years and finally it was happening, and he was so excited. He was super jazzed about it, man. He was very passionate. You could tell he was just like a little kid, just like how I feel about doing these things. He was full of excitement, and it just shows in his performance, he still has that energy and commitment. He’s just a cool guy. From there, just glancing through your IMDb list of credits, there are a lot of notable movies that we’ve all seen – like Thor and Indiana Jones and the Kingdom of the Crystal Skull. Can you talk us through the next few years and what it was like working on some of these massive franchises? Going from Jason, I was like, ‘This is great. I’m pursuing acting. I’ve got this great opportunity. I’m feeling really confident in it, and good at it, whereas I wasn’t as confident in my acting at the time. Then I got Zathura (2005) shortly after that. Jon Favreau directed it. It didn’t do great at the box office, but since then, it’s been one of the greatest movies for residuals for me, because it holds up. It’s all practical effects, done by Stan Winston. I play the Zorgon lizard. That was a big one for me. Then I went on to do Star Trek (2009). Barney Burman did my makeup on that, and he won the Academy Award for it (for Best Achievement in Makeup), and used my character in his promotion for his Academy Award. I did Land of the Lost (2009) and played a Sleestak in that. And through all this, I had a couple of kids (by this time), and I started to go, ‘Okay, this is starting to pay the bills,’ whereas I was struggling before. So I really started to push for it more. And I slowly started meeting more makeup people, and people starting hearing about me. I think about that time, around Land of the Lost and Star Trek, is when it really became like a thing, and it’s just grown from there. I consider it acting. I don’t like the label of ‘stunts’. Nothing against stuntmen or anything like that, but it really is acting. Whether I’m in a makeup, mechanical head, whatever, it’s the same thought process of, ‘Okay, this is my character. This is what he’s doing. This is his motivation,’ just creating that life. If I wasn’t an actor, I’d just be a guy doing movements and things. What makes it the best, is creating the character just like you would as an actor and bringing it to life. Obviously it’s physical, but it’s acting. Stepping into some of these iconic franchises, was it dawning on you at that point what a big deal it was to be a part of it? Yeah, it really was. Knowing that these things had been around since before I was born, and then being a part of them. Here I am playing these characters. I saw reruns of Land of the Lost and the original Star Trek when I was a kid, and here I am working on these things, and talking to Sid and Marty Krofft, and hanging with J.J. Abrams, who was becoming huge at the time and now he’s at another stratosphere. So I really was aware of where I was at and how great it was, because I had struggled a long time to get to that point. I agree that is all acting. And you’ve done work that isn’t behind a mask or makeup, and one of those roles was in a film that was at our Halloween Film Festival a few years ago, The Haunt, which you and your wife, Isabel Cueva, made. To me it’s The Office set at a haunt, and I just love it and hope to see more. Can you talk about how The Haunt came to be? You hit the nail on the head, that’s exactly what I was going for – The Office in the haunt world. Basically, it was something I had thought about for years. I had done haunts and Halloween Horror Nights years ago, and I had such funny stories. A lot of that stuff (in The Haunt) really happened. I just thought at first, ‘Wouldn’t this be a great movie?’ Then my wife said, ‘This is the TV time now. This would be a great pilot that could be ongoing.’ It would be an ongoing show. It was something I thought about for years, and then finally my wife, (writer/producer/director/actress) Isabel Cueva, said, ‘We have to do this.‘ She helped me work on it and we wrote it together. Then we were like, ‘We just need to shoot this, we’ll hire our friends,’ and that will be our tool to give them a little sizzle of where we want to go with it. That’s kind of how it all started and how it all came about. My love for haunted houses and Halloween, that’s another reason why I did it. I feel like I know that world, and I know people love that world. I want to get back at that, and get that out there more and have the world see it. And you worked with our friend Daniel Farrands (read our interview here) on Havenhurst (with Danielle Harris). Yes, I love Daniel. He’s a good friend. He’s having great success right now with his new movie, The Haunting of Sharon Tate, and it is really good. I went to the premiere screening, and it’s just amazing. He did a great job on that. You’ve been the spokesman for Jack Links for how long now? I didn’t start it, but I’ve been doing it for five years now. We just shot some in Prague that are airing now. It’s such a fun character to play. And when you do something that long, there’s no thinking. I know the character so well, I just go with it. It’s fun to do something ongoing like that. And the spots are so great too. They’re so silly and fun. It’s great. I didn’t realize how many people knew about it, but people know about it. When I do conventions, they love it and they love the Sasquatch, which is cool. I got to work with Charles Barkley and Kevin Garnett. It’s been a really cool job. I love it. I love playing that character. You also worked on Unfriended: Dark Web last year. That was fun. That was an interesting one. I didn’t know much about the dark web, and then once I started doing research on it, I was like, ‘Oh shoot, this actually pretty scary stuff.’ The first one I really enjoyed, but there’s something about the paranormal that’s like, ‘Okay, yeah that’s cool,’ but you don’t one hundred percent believe it at the end of the day. You’re dealing with what the real dark web is, and this one’s a different take on it. There’s stuff going on there, and there are some crazy people out there doing really bad stuff, that if you were to see it, you wouldn’t be able to un-see it. This movie kind of delves into that a little bit, and that’s what I think makes this one so scary, the fact that there are people like that out there. Not to spoil it for anybody, but some of the stuff that I was doing in there was pretty insane – Jeffrey Dahmer insane. Let’s talk about Hellboy. I’m not too familiar with the comics, but from what I’ve read, your character, Gruagach, is a fan favorite. Joel Harlow, who’s the makeup designer on the film, and he’s also Johnny Depp’s personal makeup artist and he’s just done Godzilla and he’s amazing, he referred me for it. We had worked together on Star Trek, and we had known each other since then. And they booked me basically off of his referral and my body of work, which is great. Because they wouldn’t have put just anybody in it, it’s great to have that body of work to show what I’ve done. It’s a benefit for me to not have to go in and audition for something. It’s always nice to get booked off of what you’ve done in the past or a referral. I was actually shooting a Jack Links commercial when I got the call. It was like a three and a half month commitment (in Bulgaria). But I said, ‘Hellboy? Hell yeah! I’ll make myself available.’ So it got all worked out without even me being in town, which was nice to come home and find out that yeah, they want to use me and they want me to come out for fittings and stuff. So that was really neat. How much time did it take to get into your Gruagach costume each day? Well it’s not a makeup, so it didn’t take long at all. It’s a fully animatronic head. They made a fiberglass skull cap based off my head cast, and off that they build the mechanics and head, and attach it to the skull cap. It’s all connected with wires, and it’s all animatronic. The whole face moves, eyes, eyebrows, cheeks, nose, mouth. So it’s a lot of weight, and it really got hot. And then the suit is super thick. It would be the equivalent of wearing five wetsuits and then wearing a head that weighs 50 pounds, and being in a squat position where you can’t breathe well, and then go ahead and perform a character. It was absolutely grueling. And it took me a while to get used to just being in it, let along performing. I couldn’t see well either. I had to look at the ground, because if I looked forward, the eyes (of the head) would be in the sky. So I’m basically looking at the ground the entire time, and I’m bumping into Milla (Jovovich) and stepping on her dress. I had to fight David Harbour (who plays Hellboy) and I couldn’t even see him, thinking, ‘Please don’t swing and hit him in the face.’ So I was dealing with a lot. But the whole process took only about a half-hour to get into. Once they put the suit on, then they attach the servos to the head, and there’s a battery pack attached to me. What they had to do was they made this special harness to take some of the weight off my neck. Even though it was still heavy on there, if had had all that weight on my back, it would’ve killed me. In between takes, I would have to have a fan on me right away. I couldn’t take the head off every time, so I would have this high powered fan that they specially made that would go in my mouth. And that would at least cool me down a little bit, because my core temp would get so extremely hot in between takes that I would have passed out if I didn’t have that fan. So it was grueling. So did the head move with your face movements? Well I would move the head and stuff, and then there were two guys with remote controls that would puppeteer the eyes and the mouth, going off of whatever I was doing. They’re great at what they do too. They would time when I moved my arms back and would get ready to do a growl, they would just know it and just go with the growl. And then there were markers around my mouth, because my character speaks, so that was the only thing that they did digitally. Even though the mouth moved, they wouldn’t be able to sync the words to the animatronic, so they had to do that digital replacement. Everything that you’re going to see is practical except for that, and except for some motion capture I did, where I grow super big in the film. That’s going to be CG-enhanced, but the rest of it is all practical, which is pretty amazing. It’s great that they did it practical in this day and age. It is. That’s why a lot of ‘80s movies that were practical hold up. Old CGI does not hold up, but practical does. And I think that’s what makes Hellboy special, if you look at the other ones, a lot of the characters were done practical. But something of this size, usually it’s done with CGI, because it’s just so massive that they don’t usually make it practical. It’s great to see that on camera. I don’t know if you saw the behind the scenes video I posted, but it’s pretty damn cool. And working with David Harbour and Milla Jovovich, was that another dream come true? I’m sure you’re a fan of theirs like I am. Absolutely. I’m throughout the film with Milla, so I got to talk to her a lot. She was great, and really cool. And David just killed it as Hellboy. He’s amazing. Acting opposite him just takes you up a notch. He brought it every time. He’s a really talented guy. Both of those people were fantastic to work with. And from what I’ve read about Gruagach, he’s pretty important to the storyline of the Blood Queen (Jovovich’s character) in the comics. He’s very important. He’s actually one of the big villains of Hellboy (comics). That’s what a lot of people who are fans have told me, that Gruagach is huge in the Hellboy universe. He and the Blood Queen are definitely tied together big time. Something else to note about this film is you could take pages of the comic and put it side by side with a lot of the scenes in this film, and they’re basically right off the page. Guillermo’s (del Toro) movies were great, but they were Guillermo’s vision. This movie is straight from the comics. This is Hellboy. I think that fans especially of the comics are going to love it, and everyone’s going to love it, in my opinion. You just have to get past the fact that Ron (Perlman) isn’t playing him, which I think a lot of people were pissed about. But how many Jasons have there been? (laughs) How many Michael Myers? It’s a great performance by a great actor. Milla Jovovich as Nimue The Blood Queen and Douglas Tait as Gruagach in ‘Hellboy’. It definitely feels like this is your moment. You’ve got A-list projects calling you now. That’s exciting for me, because I became a SAG (Screen Actors Guild) member in 1994, so I’ve been at this a long time and have been through a lot of struggles over the years, but I feel like I’ve finally come to place where I’ve not only created a niche, but I’m also consistently working on my craft as an actor, as an athlete, getting better at movements. I’m always trying to improve. I feel like I’m in a good place. And it’s great when people are starting to see your work, but it’s been a long time coming. It’s not something that happened overnight. I just want to keep going and keep getting better, and keep working on great stuff with great people. I just finished reshoots on Annabelle Comes Home. I can’t say what it is yet, but I play a really cool character. The director, Gary Dauberman, thought of me for the role. James Wan was there also, and they were both fantastic to work with. I’ve wanted to work with James Wan for years, so it was another dream come true. And again, they came to you. Yeah, I had auditioned for a TV series they were doing and Gary was a writer on it. It came down to me and another guy, and I didn’t get it. Fast forward several months later and I get the call (for Annabelle Comes Home) from the producer of both projects; Michael Clear, another amazing guy. They are such an incredible team to work with at Atomic Monster. No wonder their projects are so successful. I’m assuming this is a new character that we haven’t seen in any of the previous Conjuring universe movies? It’s definitely a new character. The horror fans are going to love it! 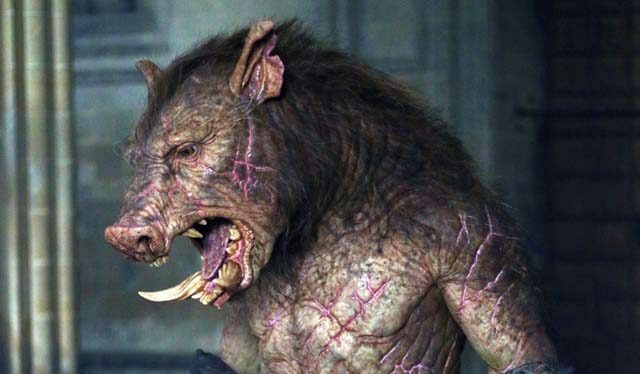 Douglas Tait is Gruagach in ‘Hellboy’.